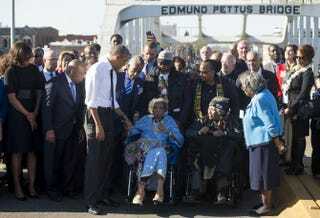 President Barack Obama speaks to Amelia Boynton Robinson (center), one of the original marchers, alongside first lady Michelle Obama (left) and U.S. Rep. John Lewis (D-Ga.), one of the original marchers, after leading a walk across the Edmund Pettus Bridge to mark the 50th anniversary of the Selma-to-Montgomery civil rights marches in Selma, Ala., March 7, 2015. Iconic civil rights activist Amelia Boynton Robinson, who almost died while helping to lead the march from Selma to Montgomery, Ala., during “Bloody Sunday” in 1965, has passed away at the age of 104, her son, Bruce Boynton, confirmed to the Associated Press. Boynton Robinson was among the many individuals fighting for civil rights who were brutally beaten while attempting to cross the Edmund Pettus Bridge in Selma in March 1965. The horrific incident became known as Bloody Sunday. A leading champion for voting rights, in 1964 she became the first black woman to run for a seat in Congress, and the first woman (black or white) to run as a Democrat from Alabama. She hoped to encourage black people to register to vote and actually vote, the newswire notes. Boynton Robinson was hospitalized earlier this year, in July, after suffering a stroke. She turned 104 on Aug. 18. Boynton Robinson’s pioneering work earned her much recognition. In January she was invited to be the special guest of U.S. Rep. Terri Sewell (D-Ala.) for President Barack Obama’s State of the Union. Sewell, the first black woman elected to Congress from Alabama, said that it was Boynton who paved the way for her. "Mrs. Boynton Robinson suffered grave injustices on the Edmund Pettus Bridge in Selma at the hands of state troopers on Bloody Sunday, yet she refused to be intimidated," Sewell said in January 2015, AP notes. "She marched with Dr. Martin Luther King, my colleague Rep. John Lewis and thousands of others from Selma to Montgomery, and ultimately witnessed the day when their work led to the passage of the historic Voting Rights Act of 1965." "To me she was a hero," Boynton's niece Germaine Bowser told AL.com. "She was fearless. We had the Ku Klux Klan shooting in our windows, throwing rocks, calling, threatening to bomb the house. She would say, well, they're afraid of us. She was calm. She took it in stride. "We knew she was a fighter. She was a feisty woman. She loved life,” Bowser added. Read more at ABC News and AL.com.